Michael McFadyen's Scuba Diving - SS Empire Gladstone During World War II both the British and American constructed vast numbers of warships and supply ships. In both cases, they picked a small number of "core" designs and built numerous almost identical ships. This procedure enabled the ships to be built cheaply and quickly and produce ships that were easy to adapt to common uses. There were some 1300 to 1400 such ships built in the United Kingdom alone. The British ships were generally about 7,100 tons gross displacement and 430 to 450 feet long. Many shipyards were used, including those at Newcastle, Glasgow and Sunderland (Belfast). In 1944 a new ship was launched from the Shipbuilding Corporation Ltd (Wear Branch) at Sunderland in Belfast, Northern Ireland. This was the third of 11 identical ships built here. The new ship was christened SS Empire Gladstone in accordance with the policy that all such ships bore the Empire prefix (a huge number of American Liberty ships were called John ....). The new ship was 7,090 tons and 450 feet overall (430 feet waterline) and 56 feet wide. Owned by the British Ministry of War Transport, the Empire Gladstone was powered by a triple expansion steam engine built by George Clark (1938) Ltd at Sunderland with three coal powered boilers supplying the steam. The Lloyds Register of 1944-45 says that it was managed by J. Chambers and Company. The ship was used for the rest of the war for transporting supplies around the Allied fronts. On 4 August 1944 she was at Tilbury in the Thames River, England (near Woolwich). Together with three other ships, the Finlay, Paul Benjamin and the Henry Austin, she loaded aboard the troops from the First Belgian Brigade. This was a motorised army group established with Belgians who had escaped Europe. It had three Independent Motorised Units which had armoured vehicles (not tanks). The three ships took on board over 2,200 troops and 500 vehicles. The Empire Gladstone took on the First Unit and the Battery of Artillery. At 1830 hours the ships left Tilbury and formed a convoy to Whistable which is on the southern side of the Thames Estuary, in Kent. At 1815 (or 2015) hours on 6 August 1944 the convoy left Whistable bound for Normandy, France. At 1000 hours on 7 August 1944 the ships started unloading their men and equipment. The troops unloaded Courseulles and the vehicles at Arromanches. 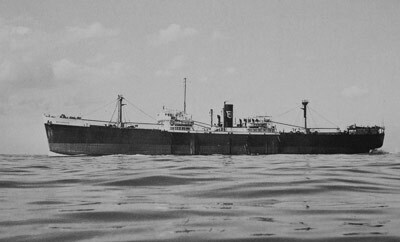 After the war, the ship remained under the ownership of the Ministry of Transport and in 1949 she was managed by Blane Steamships Ltd. She appears to have been re-engined at some time as the Lloyd's Register of 1949-50 indicates that the triple expansion steam engine was built by Markham and Co Ltd, Chesterfield. As indicated, the British Government still had ownership of the ship and the managers had rechartered the vessel to Adelaide Steamship Company Ltd about August 1949. Prior to this, the ship was in Australia on 5 May 1949 as she sailed to Fremantle (I am not sure where from). On Friday 1 September 1950, the SS Empire Gladstone left Whyalla in South Australia for Sydney and Newcastle in New South Wales. Her cargo was iron ore for the BHP steelworks in Newcastle as well as 159 Dodge utes (variously reported as being bodies or whole vehicles). I have also been advised (in March 2015) by Wal Greenrich, who was 10 years old at the time, that the bodies were in fact Holden FJs. He told me that he saw them being taken off salvage boats onto the wharf. There was a crew of 44 on board (I am not sure if this number included the skipper). 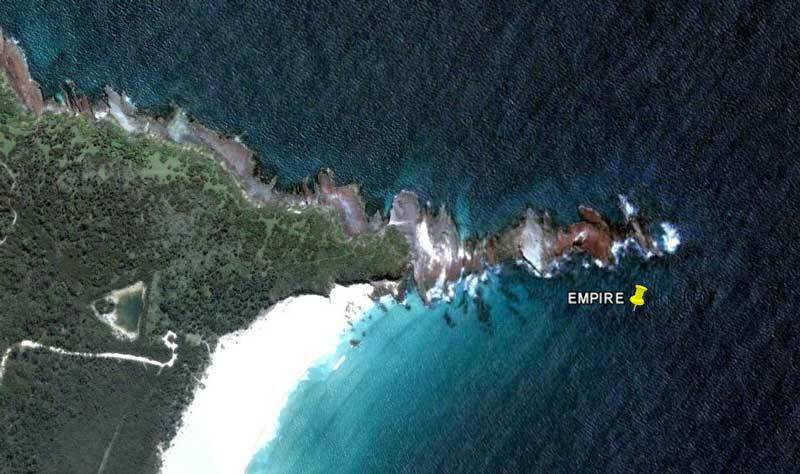 The afternoon of Tuesday 5 September 1950 saw the Empire Gladstone pass Green Cape to the south of Eden on New South Wales Far South Coast. As night fell, the skipper of the ship, Captain John Lennie, OBE, a Scotsman on his last voyage before retiring, ordered the ship to keep close to the shore to avoid the current. Just before 8 pm on 5 September 1950, the Fourth Engineer, Mr O. Eynon, who had just taken over watch, reported that the ship was steering for a point to the sea of a lighthouse. However, suddenly the lights taken to be the lighthouse were surrounded by many more lights. This was the township of Merimbula. The "lighthouse" turned out to be the lights of the Merimbula Wharf. Anyway, action was taken and the ship turned hard to starboard. However, at 7.55 pm the Empire Gladstone's stern section hit the reef of Haystack Rock. This is eight kilometres south east of Merimbula and the outermost point of the southern headland of Merimbula. She was stuck hard. Attempts were made to power the ship off the reef but the engine would not turn over. It was reported that the prop was jammed in the rocks and the rudder bent. When it was obvious that the ship would not be able to get off the reef herself, the crew were ordered to take positions near the lifeboats. The ship was not noticed by locals until 6 am the next morning. Two fishermen, Jack Warn and Ben Buckland collected together rescue gear and travelled the short distance to the wreck site. Many other small boats followed. The seas were reported as being calm. 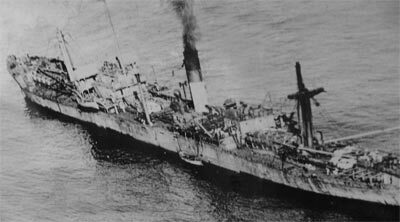 On Wednesday 6 September 1950, Captain G. A. Johns, a Lloyds assessor, inspected the ship and reported that the ship was already mortally wounded, her back broken with water already in both holds. The bow and stern sagged, ballast tanks damaged and the whole ship expected to split into two pieces. He stated that the ship would never be moved. The Sydney Morning Herald reported on 7 September 1950 that the crew were still on board the ship and that they had waved to the reporter as he flew overhead in a light aircraft the previous day. On 7 September 1950, 10 of the crew (there were only three Australians) were put ashore by the ship's lifeboats with the remaining 34 staying to unload the ship's cargo. 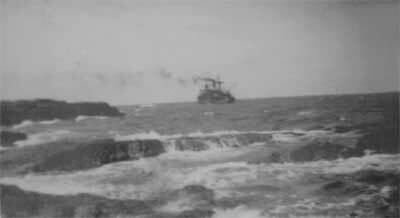 During that day, a number of trawlers from Eden were used to move the car bodies from the wreck to Merimbula. By 7 pm a total of 24 had been successfully moved to shore. By this time the water was 20 feet deep in the forward holds and was also seeping into the engine room. The ship's cargo was valued at £750,000, but most of this was the iron ore and impossible to remove. Until about 11 September 1950, the trawlers continued to remove the car bodies until they were all safely ashore. Around this time the weather deteriorated and the seas increased dramatically. The vast number of the crew were still on board and they hurriedly abandoned ship into liferafts, one powered. The trawlers towed the rafts to Merimbula. Of interest are two crewmen, Fireman Harris and Ernest Wood. Mr Harris was from London and the Herald reported that this was the ninth time he had been shipwrecked! He said "I've had it. I'm going to find myself a nice quiet job ashore. Even cats only have nine lives, and I've used up my quota." Mr Wood, the donkeygreaser, of Hull, had been shipwrecked four times before. The bell of the SS Empire Gladstone was salvaged at sometime. In 1995, Lori and Russell Chesnutt of New Zealand purchased a boat called Nadgee (which is the name of the nature reserve to the south of Eden). This boat was built in 1968 for the late Doug Everett of Eden. The boat has a bell on it which is obviously the Empire Gladstone's. 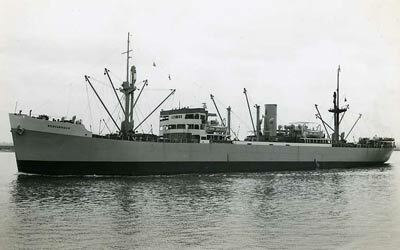 It is enscribed "Empire Gladstone, Sunderland, 1944". Mr and Mrs Chesnutt still have the bell on their boat. One of the anchors was salvaged and is in Merimbula. 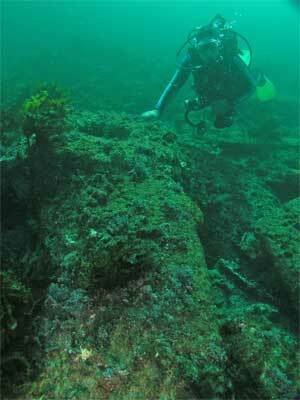 Today, the wreck of SS Empire Gladstone lies at a maximum depth of just over 10 metres. As mentioned abnove, it is about eight kilometres south-east of Merimbula. The wreck lies on the southern side of Haystack Rock (you will see where this rock got its name, there is a rock near the main rock platform that resembles a huge haystack). It takes about 20 minutes to get to the wreck from the boat ramp (mainly because a lot is only 8 knots). A good anchoring spot is GPS Reading, latitude of 36º 57' 08.2" S and longitude of 149º 56' 42.7" E. Note that all the GPS Readings on my Web Site are taken using AUS66 as the map datum. If you use another datum you may be about 220 metres off the site. See my GPS Page for more details and how to convert readings. 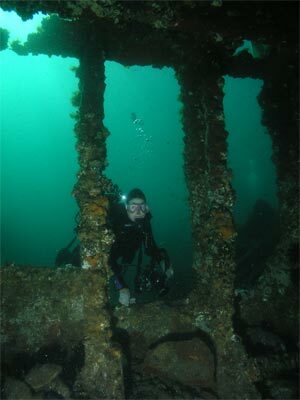 I dived this wreck back in January 1989. Until October 2005, I did not dive it again, even though I had tried to many times. When I originally wrote this article, I found it hard to recall much about the wreck although I do remember a couple of "advanced" Melbourne divers panicking about running low on air - in less than 10 metres!! I had to take them back to the boat and one then dropped his weight belt which me, the newish diver, had to rescue for them. Anyhow, from what I did remember, this was at the time an excellent wreck. As I mentioned, in October 2005 I finally dived it again. Much of what I remembered about the wreck came back but it has certainly suffered a lot of damage since 1989. My memory is that it was a far more substantial wreck in 1989 than it was in 2005. The following is a description of the wreck. The Empire Gladstone lies roughly east-west, with the stern pointing towards the shore. Whereas in 1989 the hull was fairly well intact, it has not collapsed a lot. The dive boats generally anchor near the boilers so I will start my description from there. Swim west towards the stern and follow the starboard side. You will see that the hull has collapsed a fair bit here. This area appears to be one of the holds that held the iron ore as there is lots of it all over the place. In the centre of the ship you will see the very prominent drive shaft tunnel. More about this later. A short distance along you will see a raised section. This appears to tbe the rear accommodation area. The top of the structure is flat and covered in thousands of mussels. You can swim inside this part of the wreck and it is very interesting. You can get some very good photos, with lots of light coming through the gaps between the metal. Lots of fish make this section home, blue gropers and blackfish in particular. Once you come out the rear end, you will see the prop shaft and where it comes to an end. The prop is not in place. However, if you swim the the south west from here for about 10 metres you will come across the prop lying on the bottom. Nearby there is a very large double bollard. Swim past the stern section to the north and after about 20 metres you will see a large section of wreckage. This is the stern section of the shaft tunnel. It is quite interesting. Return back to the wreck and follow the port side to the east. This is a very large wreck, it is over 100 metres to the bow from the stern. The hull at the back is fairly intact but soon it becomes smaller (in 1989 the whole hull was basically intact). You will see the shaft tunnel as you go and then a huge flywheel. The engine is right in front of this. Examine the engine. You will notice that the engine has fallen to the port side and it is broken. The centre cylinder is totally broken open. The number one and three cylinders appear to be intact. The crankshafts are (mostly) not connected to the engine. Straight in front of the engine are two boilers. Leave these for now and continue forward. The hull is even more broken open here. The whole section of ship is quite broken up but ahead the wreck rises up on a small hill. The depth here is about six metres. 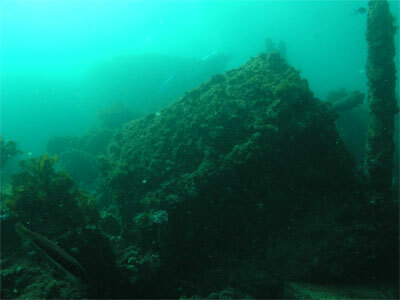 This part of the wreck has some large spaces underneath, there are lots of fish there. 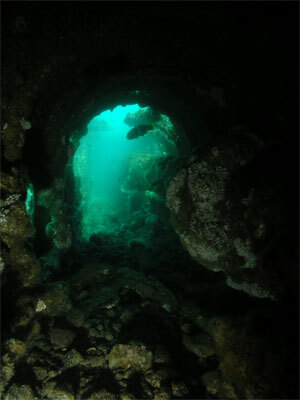 On your left the is the bommie off Haystack Rock, a vertical pillar that comes almost to the surface. Continue forward. In front of the "hill" the wreck drops a bit deeper and starts to taper to a point. It never really comes to a bowshape, but you can see that this is the very front of the ship. Explore around and see what you can find. Head back towards the stern along the starboard side of the wreck. Zigzag a bit as you go and cover the centre of the wreck. Soon you will see the boilers. As mentioned before, there are three huge boilers. One is on the starboard side and the other two on the port side. They stand upright (like a can of beer) rather than like they originally did (like a pipe). You can get some excellent photos and if you have excellent visibility, you will be able to put all three in the one shot. After you have spent enough time around the boilers, swim past them to the engine and the start of the prop shaft. You will see that the shaft enters the shaft tunnel and that the tunnel is quite intact here. In fact, there is a lot of space inside the tunnel and you can swim inside it along the left side (as you look at it). After 10 metres you will come out into the open right near the rear accommodation section. If you have any air left and you are not too cold, explore whatever section of the wreck you have most enjoyed before ascending. This wreck has some great fishlife, with lots of blackfish, blue gropers, yellowtail, silver sweep, many different species of wrasse and leatherjackets, banded morwong and much more. A very good dive, well worth doing if you get a chance. Water temperature ranges from 12° to 20°. Visibility is said to be normally quite good.